I go by this ethanol plant on my way to work, and it’s almost the highlight of the trip. * Over the years, I’ve learned that there are a few days in October and again in April when the morning sun hits the metal structure in a way that turns it into a huge cross. And that on the coldest days of the year, the low sun can make the clouds of steam glow a magnificent bright yellow. And that sometimes there’ll be a train on the long curving track moving continuously, but so slow it’s nearly imperceptible, as the grain is off-loaded. But until the other day, when it was shrouded in fog, I’d never even turned off the main road to go look more closely at the place. *I know. That’s kind of pathetic. Posted on March 26, 2017, in Photography and tagged 365 photo project, black and white photography, hockley county, industrial architecture, learning to see, Leica, levelland, melinda green harvey, monochrome, one day one image, photo a day, photography, postaday, texas, thoughtful seeing. Bookmark the permalink. 6 Comments. Thanks, and I’m glad you liked the story. I’m maybe a little sneakier than you realized…! 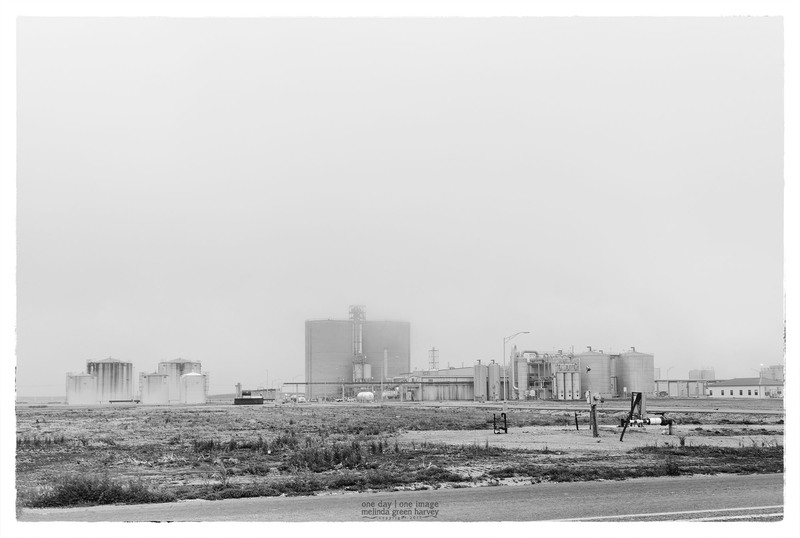 That ethanol plant may become my new photographic obsession.